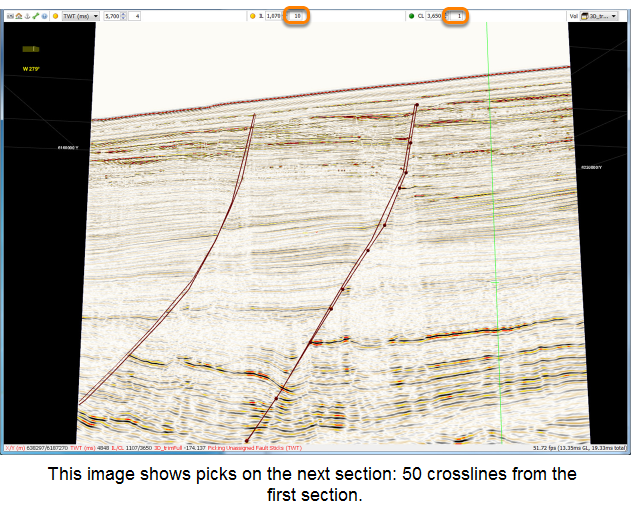 Picking unassigned fault sticks is a useful technique when interpreting 2D or poor quality 3D data. 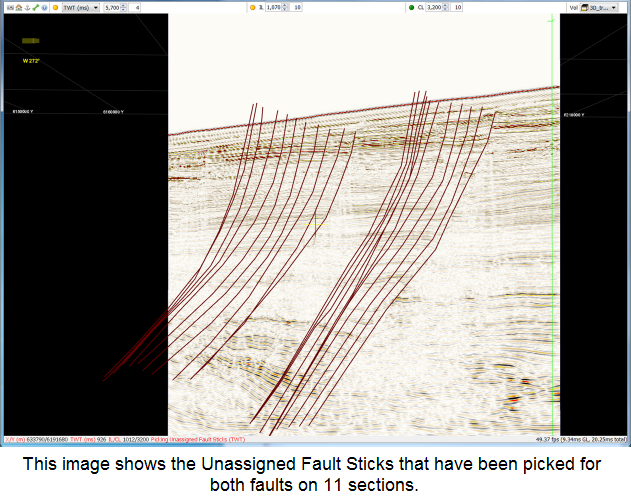 Unassigned fault sticks can be picked across several lines, then combined into faults when the structure becomes more clear. To start picking fault sticks, enter Edit mode by clicking on the pencil icon. The background around the pencil will become green. Note: You can pick a single fault on any view or combination of views. You are not limited to picking in a single domain. 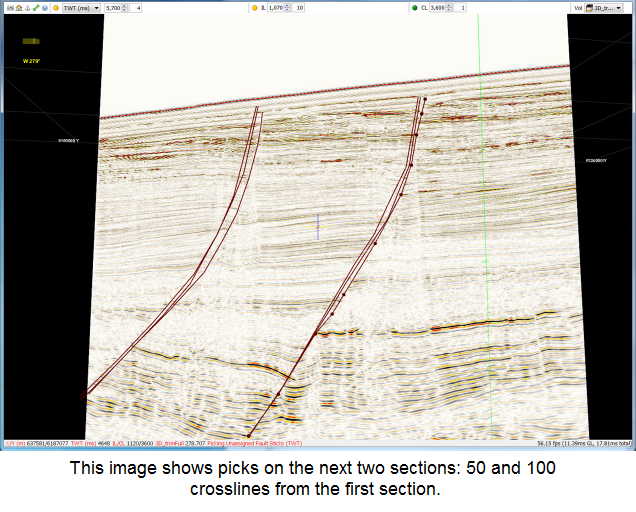 These faults were picked in the 3D View on crosslines with both the TWT Slice and inlines tuned off. To pick the fault, place the crosshairs over the starting point and left-click. Continue down the fault by left-clicking to create another point. These picks will be connected by straight lines. If you wish to move a point, you can first remove it and then replace it, or you can hold Ctrl + left click and drag the point to where you want. Double click to place a final pick or right click to complete the picking. You can add points by placing the crosshair over the fault stick and left clicking. You can move the point if you hold down left mouse button and move the crosshairs. To remove the sticks place the crosshairs over the fault stick and right-click. The fault stick will become thicker and a small menu will appear. You can select the action you wish to perform from that menu. 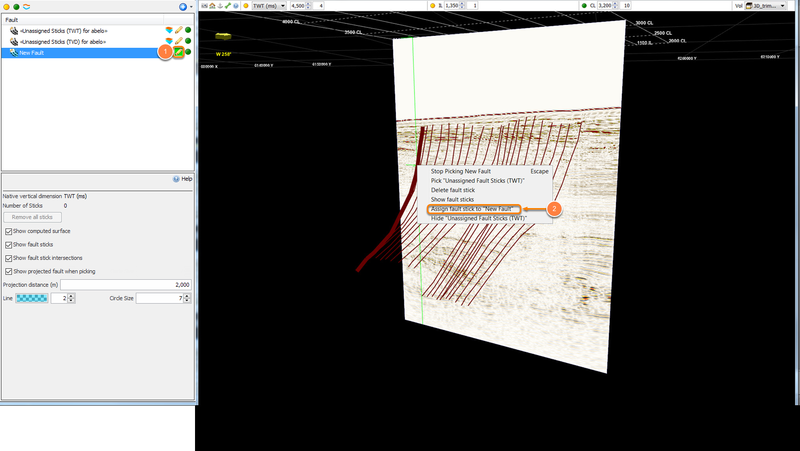 Note: Click the Show projected fault when picking check box in the Details Panel and set the projection distance to display projected faults on vertical sections (see Show Projected Fault). Continue picking the second fault as “Unassigned Fault Sticks”. 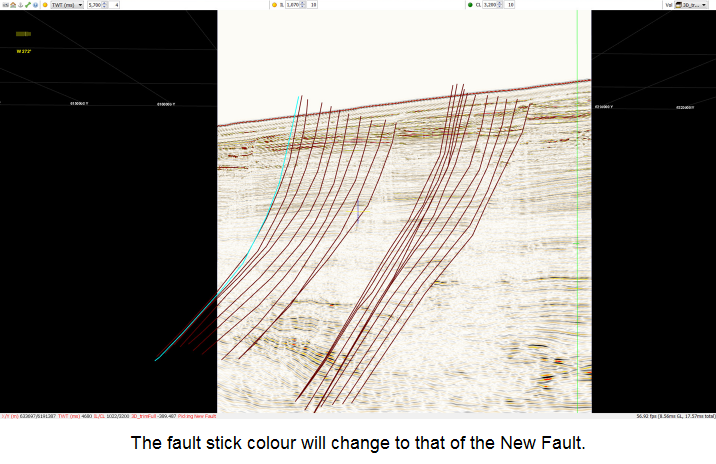 We will assign fault sticks to particular faults later on. Continue picking Unassigned Fault Sticks for both faults on 11 sections (every 50 crosslines). If we set an inline or crossline increment, we can quickly jump between locations using the arrow keys. This can help us pick the fault at regular intervals and easily compare the current pick with the previous one. To assign Unassigned Fault Sticks to the New Fault, click the pencil icon next to New Fault in the Fault tab so that it is in Edit mode. Place the crosshairs over each fault stick and right-click. In the pop-up menu, click Assign fault stick to New Fault. 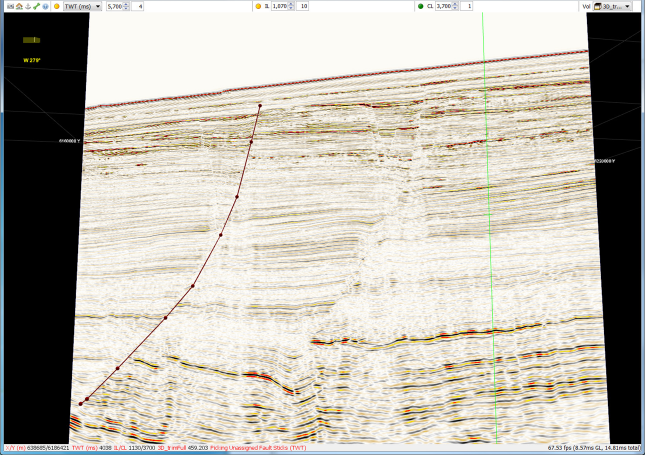 As you continue to assign fault sticks to the New Fault, the fault plane surface will automatically tessellate. When you have completed assigning the fault sticks of the first fault to New Fault, you must return to the Fault tab, click on the pencil icon next to New Fault to turn off edit mode, or press Esc. Create a second fault in the Control Panel and assign the remaining fault sticks to the second fault. Click on the pencil icon next to New Fault 2 to turn on Edit mode. Repeat the above procedure to assign all remaining fault sticks to New Fault 2.